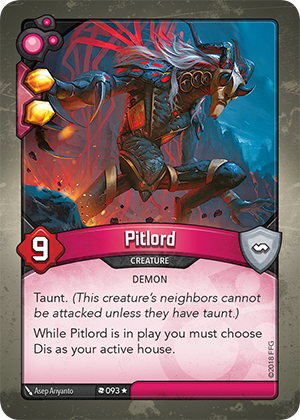 While Pitlord is in play you must choose Dis as your active house. I have the card Pitlord in play and my opponent plays the card Restringuntus and chooses house Dis. Can I select a house on my turn? Yes. “Cannot” effects take precedence over “must” effects. Therefore, Restringuntus would effectively override the effect of Pitlord and you would be able to select either of the two houses not restricted by Restringuntus.